Inspired by the #etmooc community’s latest learning endeavor—a tweet chat that drew community members together for a lively hour-long discussion about integrating Twitter into learning earlier this week—Levine combines his usual wicked sense of humor and insightful perspective into a set of reflections that should inspire any trainer-teacher-learner. 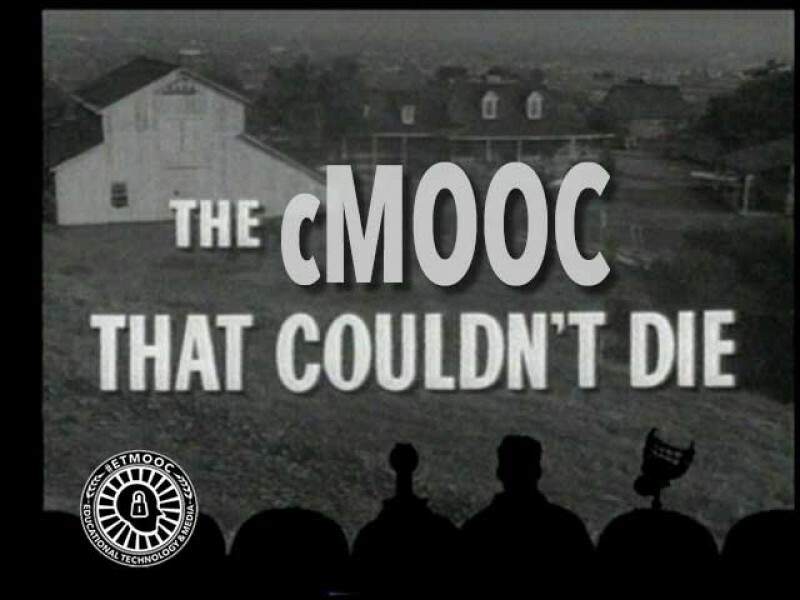 I’ve been among those writing extensively about the unexpected longevity of #etmooc as a learning experience/community; a model for lifelong learning communities; and an example of how connectivist MOOCs (cMOOCs) are beginning to serve as a new form of (collaboratively-produced) textbook; in fact, I’ve probably produced enough to kill a small forest of virtual trees, and am far from finished with the topic. But none of that stops me from eagerly reading and learning from Levine’s “cMOOC That Would Not Die” and recognizing it as a manifestation of the very thing it is exploring. The playfulness with which he tackles his topic reflects the playfulness that was at the heart of the learning process in #etmooc (and, for that matter, almost every significant learning experience I can remember having). That same playfulness is certainly one of the elements that binds members of the #etmooc community together, as anyone reading the slightly-edited transcript of the integrating-Twitter-into-learning session can’t help but notice. The sense of camaraderie is palpable, and when I talk with friends and colleagues about the value of engagement in training-teaching-learning, I often wonder aloud why so many people seem to be reticent about fostering a sense of community in the learning process. His reflections further serve as a manifestation how he and other #etmooc community members learn via extended cross-platform asynchronous exchanges that inspire additional collaborations: he blogs; we read; we respond via the sort of linked response I’m producing here; and we extend the conversation via comments on his own blog site as well as via tweets that call attention to his blogged reflections—a process that is continuing to unfold even as I write these words. As I often note in learning sessions I facilitate, this is a wonderfully messy and engaging approach to learning—one that offers numerous rewards while also inspiring us to learn how to learn through entirely different approaches to learning than we ever expected to encounter. It’s what many of us learned, from Dave Cormier, to refer to and think of as rhizomatic learning—learning that expands as rapidly and expansively as rhizomes do. Okon was—and remains—right. We continue to learn together in a variety of settings. To work together (several of us went on to design and facilitate another connectivist MOOC). To write about it individually and as co-writers. And to engage in teaching-training-learning-doing so that the community continues to grow by acquiring new members and inspiring others to produce their own versions of our successes. It’s not often that I’m invited to attend a birthday party for a course—but then again, it’s not often that I find myself immersed in a learning opportunity that produces the sort of sustainable community of learning that #etmooc has. That wonderful massive open online course (MOOC)—the Educational Technology and Media MOOC that Alec Couros and others offered to great acclaim in early 2013—was something that many of us heard about from colleagues or simply stumbled across during our general online explorations of MOOCs last year. The results (as have been so wonderfully documented in numerous blog postings including one written by #etmooc colleague Christina Hendricks, on the course Google+ community that continues to thrive nearly a year after the course formally ended, and in live tweet chats) inspired course colleagues Rhonda Jessen and Susan Spellman Cann to organize and facilitate a first-anniversary online gathering of #etmooc alums via Twitter last week. The results were predictably positive. Some of us who were drawn together through #etmooc and have remained in contact online were there, as were others who have not been as active in the post-#etmooc community—but clearly remain transformed, as teacher-trainer-learners, by what we all experienced. The full Storify transcript of the anniversary session compiled by Jesson and capturing more than 400 tweets from approximately 75 participants in that hour-long session is just the latest example of what a well-organized and wonderfully-facilitated MOOC can inspire—the transcript itself is a learning object that others can use and review if they want to bypass the meaningless exchanges about how few people “complete” a MOOC and look, instead, to see the sort of long-term learning that the best of MOOCs—particularly connectivist MOOCs—produce. One of the many keys to the success of #etmooc as a learning experience and a sustainable community of learning is that it started as an opportunity to explore educational technology in a way that encouraged learners to become familiar with the material by using the resources being studied. If we wanted to see how blogging could be integrated into learning, we blogged and saw our work collected and made accessible through a blog hub that continues to thrive to this day as a resource with nearly 4,000 posts that would not otherwise exist for anyone interested in teaching-training-learning. If we wanted to see how Twitter could easily be incorporated into the learning process, we used Twitter as a vehicle to further our learning and, furthermore, saw those exchanges reach into other communities of learning. If we wanted to see how live interactive online sessions could draw us together and become archived learning objects, we participated in live online sessions through Blackboard Collaborate or viewed archived versions so compelling that they felt as if they were live rather than taped learning sessions. Another key to its success is that the learning has never stopped. 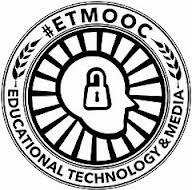 In setting up the anniversary celebration—in essence, an #etmooc birthday party—Jessen and Cann encouraged all of us to continue documenting our MOOC successes by blogging about what we had learned and accomplished as a result of our participation. I look at the numerous blog postings I wrote and stand in awe of what Couros, his co-conspirators, and my MOOCmates inspired. I look at how participation in #etmooc led to participation in another connectivist MOOC–#xplrpln, the Exploring Personal Learning Networks MOOC that was a direct offshoot (from Jeff Merrell and Kimberly Scott at Northwestern University) in fall of 2013. 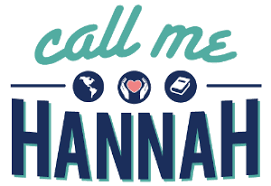 And I continue to hold far more gratitude than I can ever express for the ways these experiences have made me a better trainer-teacher-learner as I continue exploring ways to facilitate learning opportunities that benefit learners and those they serve in a variety of settings not only here in the United States but in other countries. That’s what draws me to the work I do, and that’s what makes me believe, each time I think about the field of learning and how it connects us to each other, that it’s one of the most rewarding and transformative of endeavors any of us can undertake. N.B. 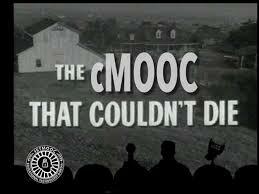 : This is part of a continuing series of posts inspired by participation in #etmooc and other MOOCs. Because we can often learn by reaching outside of our usual professional and social circles for ideas, those of us interested in more effectively using blogging in our work have a lot to gain by skimming David Risley’s 49-page “Six Figure Blogger Blueprint” (available as a free download on the upper right-hand corner of his blog site). While Risley writes much of his publication for those interested in making money from blogging, he offers a first-rate blogger’s primer that hits its stride with a “deciding what to blog about (market selection)” section starting on page 13 of the document. His initial question takes us back to basic principles: “Can you help your reader solve real problems that exist in the real world?” We’ve seen this principle at work recently on ALA Learning through postings by Peter Bromberg, Stephanie Zimmerman, Jay Turner, Marianne Lenox, and others; faithful readers of others blogs written by and for staff of libraries and nonprofit organizations can confirm that they are drawn to those that help them solve problems they are facing or are about to face. “Focus on how your information is going to benefit the lives of your readers,” Risley continues, and his admonition serves as a great reminder to all writers that the difference between a well read, helpful blog and one that collects virtual dust for lack of readers is that critically important attention given to readers rather than to the writer’s ego. 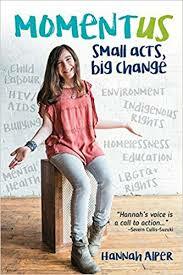 If we remember that it’s not all about us—although, in the best of worlds, our own writer’s voice becomes part of the value we provide—we take our blogging to a level which attracts and serves readers well and builds connections between them and the organizations we serve. His “step-by-step blog launch plan and roadmap” (beginning on p. 41) reminds all of us to stay focused on our blog’s target audience; set a cohesive blog theme; create a few very valuable articles at the beginning to lay the foundations for a successful blog; and use social networking tools to effectively extend the reach of all you do. And above all, keep writing. “The idea is that you use a blog to build up an audience and build relationships with your readers,” he reminds us (p. 33), and that’s a theme that resonates loudly and clearly with all workplace learning and performance professionals as we strive to create effective communities of learning and provide measurable results for the organizations with which we work.